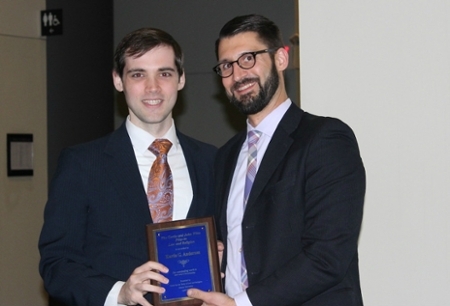 Kurtis Anderson (JD 2017) won the 2017 Gertie and John Witte Prize for Outstanding Work in Law and Religion, which was established in 2014 to honor the parents of Center Director John Witte, Jr. Along with the Eliza Ellison Prize, it is the most significant honor the Center bestows on students. It recognizes a student who has shown excellence in the Christian Legal Studies program. Anderson was active in the Center's Restoring Religious Freedom Project, under the direction of Mark Goldfeder. In the summer of 2016, he served as foreign law clerks for the Supreme Court of Israel, where he researched issues of interest to justices, drawing from European and American law.